Today we took the pumpkin to the scale and had a pleasant surprise. I kind of thought my pumpkin would go heavy but I didn't expect it to go 9% heavy which pushed me up to 837 pounds and a 4th place finish overall. A big thanks for the support of my wife and family in allowing this season to take place. Also a big thanks to the growers in the RMGVG. Top honors today went to Joe Scherber with a very nice 1,225 pounder. A very nice pumpkin. 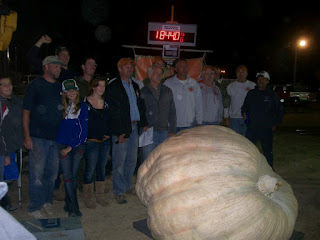 A new world record pumpkin was weighed yesterday. 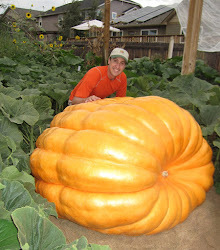 An absolutely amazing 2,009 pounds grown by Ron Wallace of Rhode Island. I've had dinner with Ron and he is a class act so a very big congrats to him. 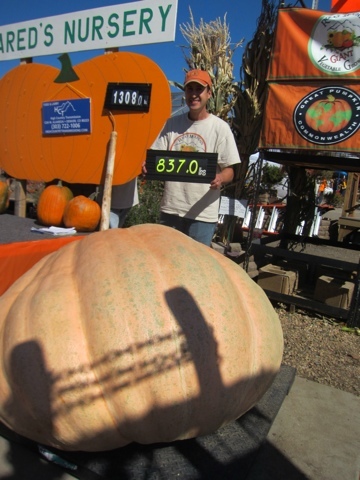 Congrats to grower Steve Geddes for a new world record pumpkin weighed at the Deerfield fair N.H. An amazing 1843.5 pounds! More big ones to still come to the scale over the next couple of weeks so we will have to see if this record will stand. There are rumors of pumpkins estimating much bigger than this still out there. The cutting of the vine will be happening between 6:30-7:00 tomorrow. Much hotter than average weather and disease has made this season challenging but I've learned from this season and enjoyed it. On Saturday morning we will find out finally what Christine the pumpkin weighs. 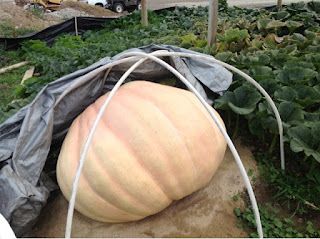 Pictures from the weigh-off will be posted here and on www.facebook.com/giantpumpkins along with weigh-off results on Saturday. I haven't measured the pumpkin this week but my little experiment might have worked. I noticed when I uncovered the pumpkin this morning that there were some cracks on the surface of pumpkin from new growth. These cracks aren't anything for me to worry about, just mild cracks because the surface of the pumpkin is getting brittle from being old. You often see that this time of the year. The good news is that this means the pumpkin is growing. If she can hold together for about 30 more hours we will be good. Vine cutting tomorrow! Monday I decided to take a risk with my pumpkin to add on some final weight. On Monday evening I gave my plant about a cup of liquid seaweed (0-0-1) both as a drench and foliar, along with 1/3 cup of Big Bloom (.5-.5-.7) and a tablespoon of Sol-Po-Mag (0-0-22). On Tuesday between watering and the most rain we have seen in weeks I gave the plant got a healthy dose of water. This is a good way to slit your pumpkin open wide if you aren't careful. Particularly if you were to do that during the rapid growth stages earlier in the season. However, I did this as a calculated risk. 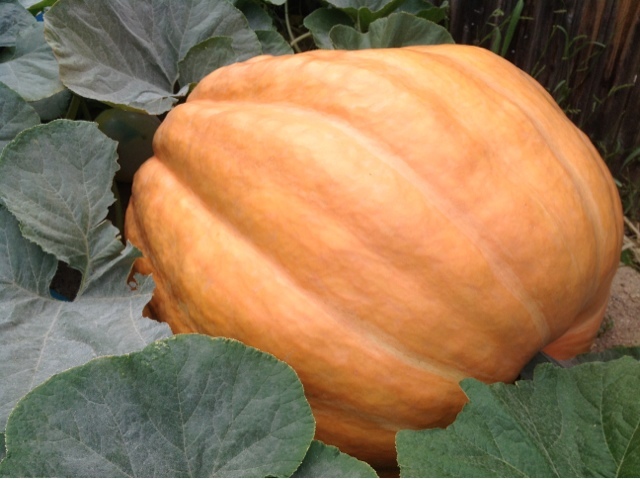 This pumpkin has only been putting on 4-5 pounds a day at this point and it seems to be thick. A bit of a spike in growth I think it could handle and this pumpkin isn't going to break any records for me so I figured I would do a little experiment. The fertilizer was evenly spread over the whole plant so I don't have to worry about jacking up the soil. I don't expect a lot of extra growth but since potassium helps regulate water movement in the pumpkin plant it could help hydrate the pumpkin and add a few extra pounds that way. Almost Giant Pumpkin Weigh-off Time! The following is information for the next two weigh-offs. I'll be taking my pumpkin to Jared's one week from today. Stop by and say high if you see me. There are two other weigh-offs after these so watch for additional information to come. If you have kids the above two weigh-offs they will love. Lots of games, food, giant pumpkins and activities. If you have never seen a pumpkin over 1,000 pounds these two weigh-offs will the place to be. At Jared's grower Don Young is supposed to be bringing a pumpkin. They have had tough weather in Iowa this year but Don in the past has grown a number of pumpkins over 1,600 pounds and is a really nice guy. You may have seen his giant pumpkin on Conan O'Briens show a few years back get crushed by a monster truck. 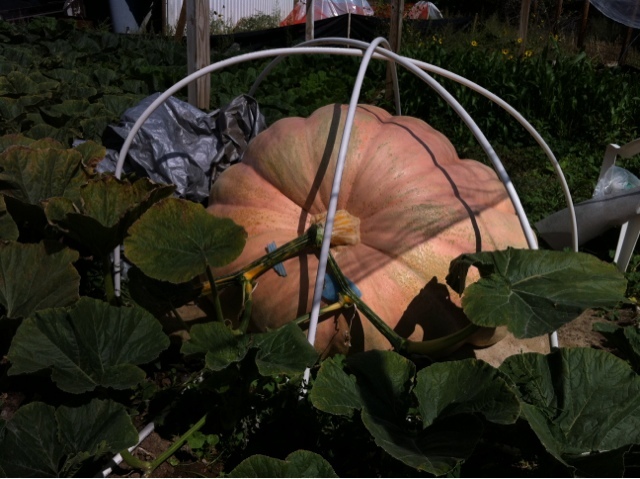 At Jared's or Nick's, rumor has it, that a possible state record pumpkin will be brought that may weigh over 1,400 pounds. We will just have to wait and see. This evening I gave the plant some foliar and drench Big Bloom fertilizer. On Monday I'm going to try something new to get some last pounds added to the pumpkin before the weigh-off. Wish I could grow on a scale so I could see if it actually works. If the pumpkin ends up 15% heavy then maybe we can say it worked. One week from tonight I'll be cutting the pumpkin from the vine! In this cool part of the growing season it can be hard to get descent gains late in the season. 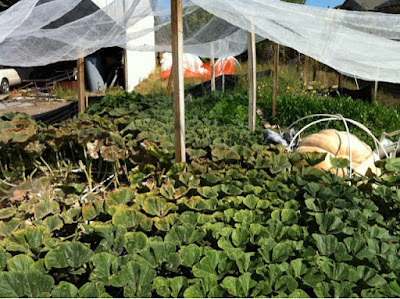 Cooler weather on a tired plant makes it harder for the pumpkin to get at nutrients. 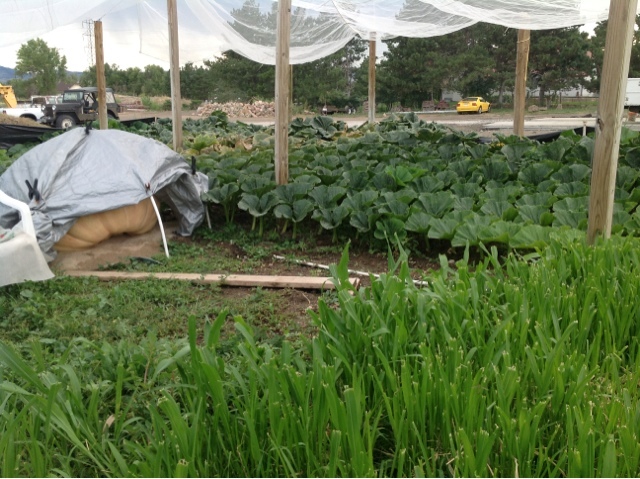 There is something like 200% more biological activity in the soil between 72 degrees and 80 degrees. Cold temps mean the little guys in the soil aren't breaking down as much material and as a result the plant gets less nutrients. Saturday and Sunday we had above average temperatures and it showed on the pumpkin. I wasn't sure if the pumpkin had stopped growing but nearly 8 pounds of growth a day Since Saturday which was a pleasant surprise. I know the tape wasn't lying because it was the first time I had trouble getting between the poles and the pumpkin when I was measuring. I gave the plant some foliar and drench Neptune's Fish & Seaweed this evening. The clock is ticking down now. Just 14 days from when I cut the pumpkin from the vine. Just did a measurement and the pumpkin is still growing. At this point in the season you just hope the pumpkin stays together. Water, fertilizer and checking for soft spots is pretty much all there is left to do before vine cutting. Yesterday evening I gave the plant some liquid seaweed and Big Bloom both foliar and as a drench. I haven't measure the pumpkin in a number of days now but I can see the pumpkin is still growing. Looks like weather is going to be very nice for the new few days and I want to take advantage of that as much as possible. Two weeks from today I'll be cutting the pumpkin off the vine. What are these liquidy drops falling from the sky? I can't say I've seen any real rain in ages at the house. Nothing waters a pumpkin patch link good old rain. I use an under the leaf watering system as well as an over the top watering system on a daily basis and nothing gets the ground soaked more evenly than rain. Cool temperatures for the next two days and then we will be back on a warming trend in the mid 80s to put some pounds back on the pumpkin again. Yesterday, for the first time, growth dropped off from 8-9 pounds a day to 3 pounds. I only measure every couple of days so I wouldn't be surprised if the pumpkin has stopped growing. In one last attempt at squeezing some extra pounds out of this pumpkin I gave the plant some extra water today along with a descent helping of liquid seaweed (0-0-1). In a few days I'll measure again and see if anything has happened. If it has stopped growing I'll keep the pumpkin on the vine but keep the pumpkin covered to help make sure it makes it to the scale. I noticed some bite marks on my pumpkin this morning. The voles always seem to like to take some nibbles around this time of year. I sprayed a 10% dilution of bleach on the bite marks to help keep it from rotting out and to discourage future bites. Usually I put a ring of moth balls around the pumpkin and that works very well but I've run out of moth balls. There is a snake that lives on the edge of the patch I'm hoping does his job soon. I saw him with a nice bump in his mid section a month ago so he is the vole/mouse eating variety. 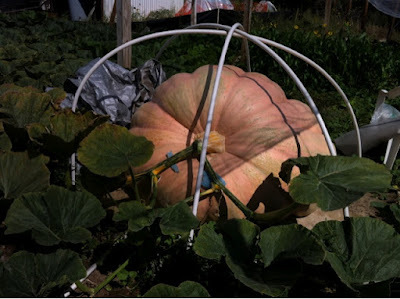 The pumpkin has grown very consistently for the last three weeks now. I thought with the cooler nights that we would slow down some but that hasn't been the case so far. If the pumpkin can maintain that for another two weeks we will be in descent position come vine cutting time. I gave the plant some calcium this evening. This evening I gave the pumpkin plant some compost tea that had a handful of alfalfa pellets, 1/8 cup of molasses, 1/8 cup seaweed, pinch of blood meal, 1/8 cup humic acid, 1 teaspoon of fish & seaweed, one dried leaf and just a pinch of compost. I took that 4 gallons of compost tea that has been aerated for 24 hours and put it on all of the leaves and then poured some around the stump of the plant. This is definitely a little stronger brew then my normal compost tea. Cooler weather is coming to Colorado on Wednesday so I figured I'd give the plant one last little push before the weather rolls in. 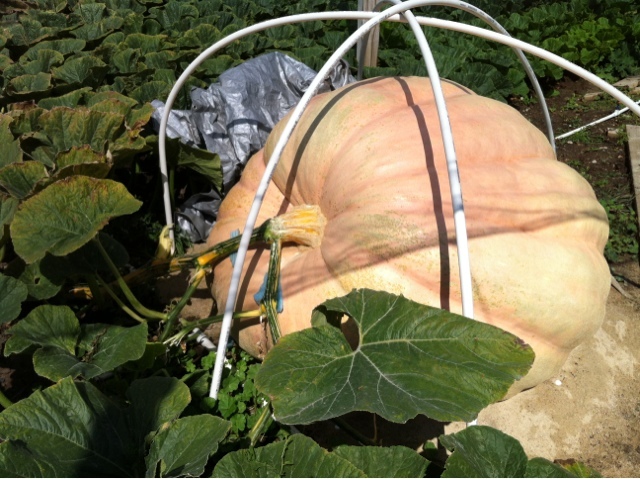 This is the 1451 Scherber one month before the weigh-off. The last picture is my kids' 924 Johnson. Today I terminated all of the vines except for the main vine. I also wiped down the pumpkin with a 10% solution of bleach.